The Centurion line of software offers complete and comprehensive options for our customers. From unit programming to advanced data reporting the software comes in four versions to provide better functionality to users needs. Centurion is licensed on a per computer basis. Issuance of license code typically occurs in 3-5 business days from receipt of registration information. Many parks and recreation agencies only collect volume data and are not interested in collecting speed or classification data. Centurion Parks is suited perfectly for these organizations as the interface is centered around volume counts and the ability to produce reports and data exports in simple volume formats. It also includes the ability to program and download data from the units directly. Cities and counties and other regional organizations focus on providing short count or portable study data. This includes collecting volume and class data concurrently in most cases. Centurion CC provides a fully featured database and reporting engine for processing and reporting classification and volume data alike. For use with the Road Runner 3, Centurion Free is a complete solution for short temporary road tube speed, class and volume counting studies. With all a complete feature set and data options, Centurion Free is a perfect solution for all users in the field and office using the Road Runner 3 unit. 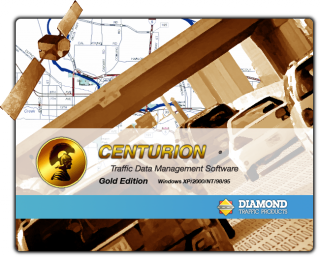 Centurion Gold is a complete software solution for users who need an automated and data warehousing solution. The software has communication, database, and reporting included and provides advanced exporting and data processing as well as auto-polling of data sites for user free operation. No matter if you are looking for a simple volume counter or a permanent real time traffic sol. . .